You only need 4 ingredients to make the ultimate Golden Margarita! One sip and you will never drink a mix again. This Golden Margarita is a simple, tasty classic that needs to go to the top of your must-make list. Once you have one of these, you’ll never go back to the bottled mix again. 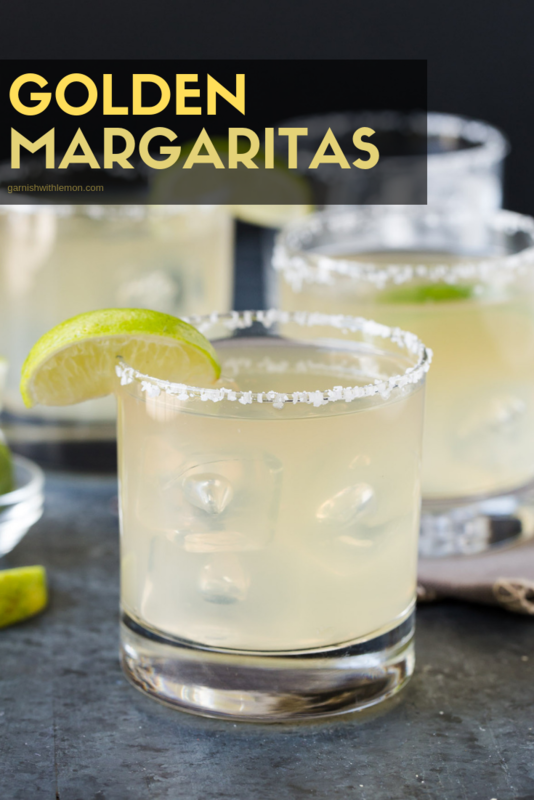 This margarita recipe is single-handedly responsible for making Kevin and I margarita snobs. There are few restaurants that we will order one in and be happy with the taste. But with this killer recipe in our back pocket they are a snap to make at home. And once you try them, you may join the ranks too. It’s no secret we are tequila lovers. We have many different margarita recipes on Garnish with Lemon with the Blueberry and the Elderflower being two of our favorites. But sometimes you just need a classic. In my opinion, the best margaritas have a short ingredient list and always use fresh lime juice. Don’t get me wrong, I have used the bottled juice in a pinch, but trust me when I say that juicing the limes is worth every single second. Batch cocktail tip: These Golden Margaritas make the perfect batch cocktail. Simply multiply the ingredients by the number of servings desired and mix in a pitcher. Pour over ice and serve! We always drink our margaritas out of these glasses. No margarita glasses for us. Does anyone else have problems drinking out of a margarita glass? I spill without fail every time I try. And who wants to waste good tequila? Not me. We just salt the rims on these glasses and sip away! Which of course brings up the big debate: salt or no salt on your margarita. Me? I’m a salt girl. Anna? No salt for her. 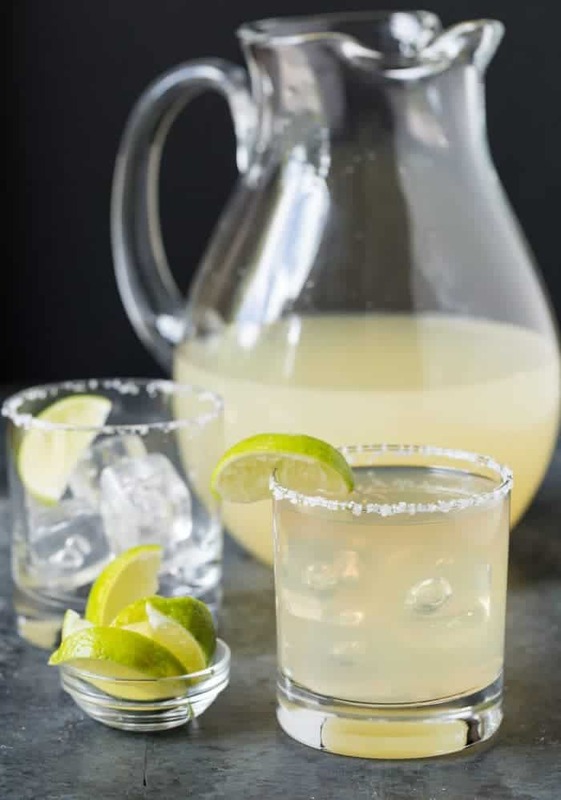 Salt or no salt, you definitely come out ahead with this margarita recipe in your files. 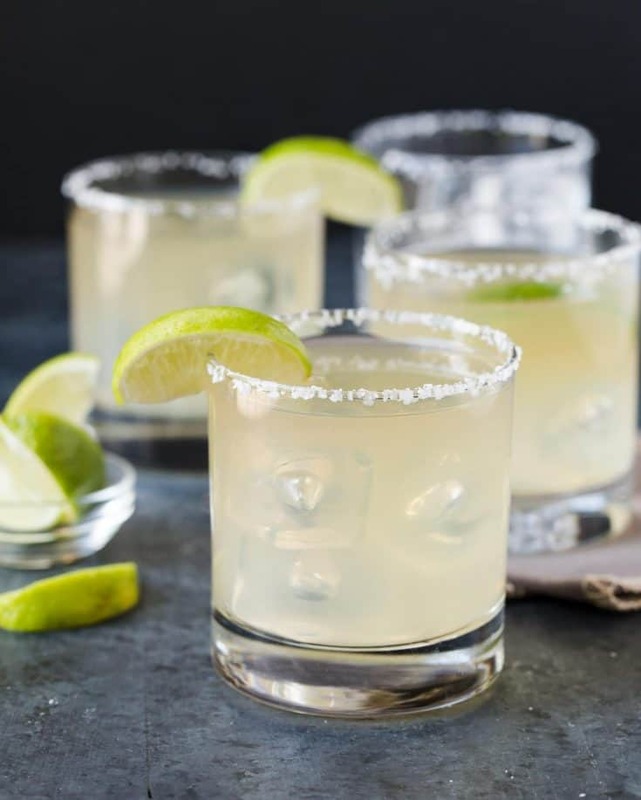 You only need for ingredients for these spectacular margaritas! Run lime wedge around rim of a high ball glass to moisten so salt will stick. Turn glass upside down in salt to coat the edges. Fill with ice. Pour tequila, Grand Marnier, lime juice and simple syrup in a cocktail shaker filled with ice. Shake vigorously to mix and pour over ice in prepared glass. Serve immediately. Nice. Sand, sun, and margaritas! Looks so amazing – luckily I can sit outside and drink this bad boy since I live in San Diego. I might have to come join you, Liz! 🙂 Cheers! How lovely is this drink!! The bright color makes me think of sunshine and warmth. 🙂 Not cold dreariness like I’m currently surrounded by!